Envisaged to eventually house 350,000 residents, with apartments complemented by commercial and industrial space, Nam Tong would be built partly on existing land and partly on newly reclaimed land. 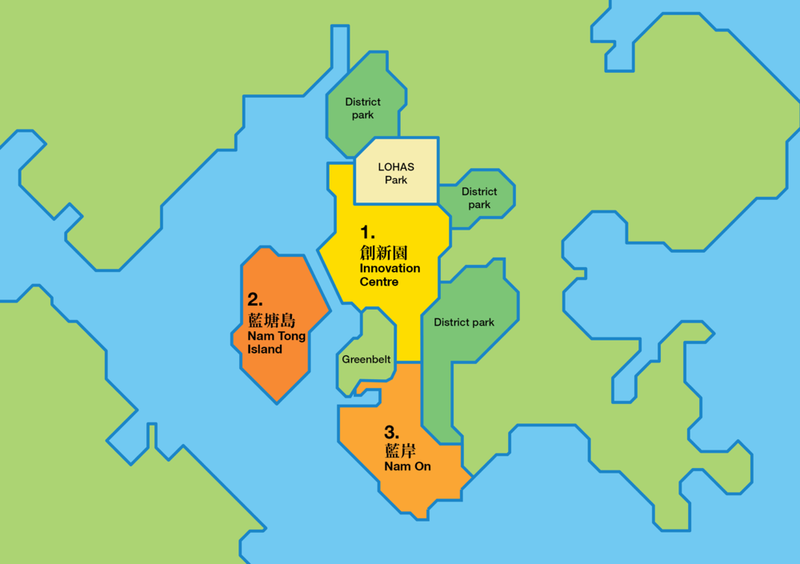 The existing land mainly comprises the Tseung Kwan O Industrial Estate and the Tseung Kwan O Area 137 Fill Bank, which the government plans to develop to house 100,000 residents. In a sense, Nam Tong represents a scaling-up of this existing plan to form a larger, more balanced new town. Fat Tong Chau, a former island, will be conserved as the town’s historic centrepiece and as a greenbelt zone with trails and historic buildings. Flanking the island are the three main development zones: Innovation Centre, Nam Tong Island, and Nam On. Each of these districts shall be centred on a new MTR station, with all development taking place within walking distance of the MTR. Innovation Centre builds on government efforts to promote the development of the high-tech industries in the Tseung Kwan O Industrial Estate. Nam Tong Island is a dense, vibrant, mixed-use centre with a balance of residential flats and commercial space – Hong Kong’s third CBD. Nam On is envisaged as a leisure-oriented seaside district with an artificial beach and hotels – akin to Gold Coast in Tuen Mun. Residents and visitors alike can enjoy a new network of coastal parks integrated with the existing Tseung Kwan O waterfront promenade. The parks shall be oriented to maximise views of the Tseung Kwan O skyline, the Victoria Harbour entrance, and the open sea. The massive closed landfills that surround the site would be redeveloped as expansive district parks, with good connectivity to the Clear Water Bay Country Park beyond.